Happy New Year, American Masters fans! 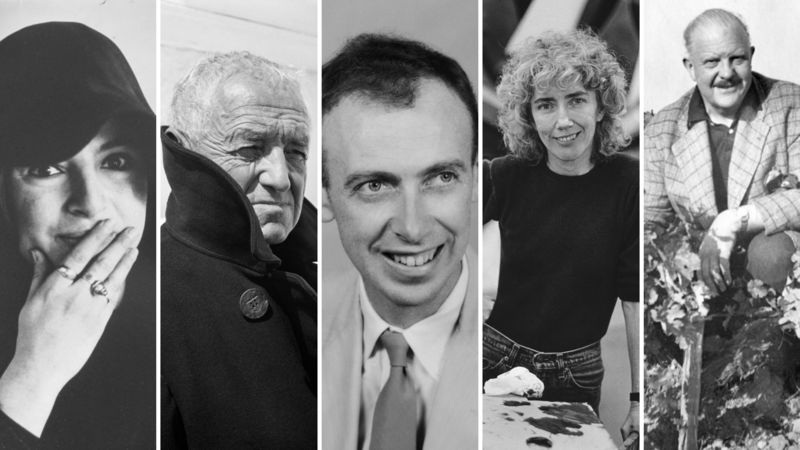 This month, we’re presenting documentaries about artists Eva Hesse, Andrew Wyeth and Elizabeth Murray, chef James Beard and scientist James Watson. Enjoy these films now streaming for a limited time via pbs.org/americanmasters and PBS apps. As the wild ride of the 1960s came to a close, Eva Hesse, a 34-year-old German-born American artist was cresting the wave of a swiftly rising career. One of the few women recognized as central to the New York art scene, she had over 20 group shows scheduled for 1970 in addition to being chosen for a cover article in ArtForum Magazine. Her inventive sculptures were finally receiving both the critical and commercial attention they deserved. When she died in May 1970 from a brain tumor, the life of one of that decades’ most passionate and brilliant artists was tragically cut short. American Masters deepens the understanding of this extraordinary artist, not only in terms of her innovative work with fiberglass and latex, but also the life that provided the fertile soil for her achievements. Through dozens of new interviews, Hesse’s artwork and a wealth of newly discovered archival imagery, the documentary traces Hesse’s path and delves deep into the creative communities of 1960s New York and Germany. Written and directed by Marcie Begleiter. Wyeth tells the story of one of America’s most popular, but least understood, artists – Andrew Wyeth. Son of the famous illustrator N.C. Wyeth, Andrew had his first exhibition at age 20, and his painting “Christina’s World” was acquired by the Museum of Modern Art in 1948. While Wyeth’s exhibitions routinely broke attendance records, art world critics continually assaulted his work. Detailing the stunning drawings and powerful portraits he created in Chadds Ford, Pa., and on the coast of Cushing, Maine, Wyeth explores his inspirations, including neighbor Christina Olsen and his hidden muse, the German model Helga Testorf, who he painted secretly for 15 years. Through unprecedented access to Wyeth’s family members, including sons Jamie and Nicholas Wyeth, and never-before-seen archival materials from the family’s personal collection and hundreds of Wyeth’s studies, drawings and paintings, American Masters presents the most complete portrait of the artist yet — bearing witness to a legacy just at the moment it is evolving. Directed by Glenn Holsten, the film is available on Digital HD and DVD via PBS Distribution. Thrust into the limelight for discovering the secret of life at age 25 with Francis Crick, influential Nobel Prize-winning scientist James Watson has thrived on making headlines ever since. His discovery of DNA’s structure, the double helix, revolutionized human understanding of how life works. He was a relentless and sometimes ruthless visionary who led the Human Genome project and turned Harvard University and Cold Spring Harbor Laboratory into powerhouses of molecular biology. With unprecedented access to Watson, his wife Elizabeth and sons Rufus and Duncan over the course of a year, American Masters explores Watson’s evolution from socially awkward postdoc to notorious scientific genius to discredited nonagenarian, also interviewing his friends, his colleagues, scientists and historians. Controversial and unapologetic, Watson still thrives on competition and disruption. The film uncovers his signature achievements, complexities and contradictions, including his penchant for expressing unfiltered and objectionable points of view. Directed and produced by Mark Mannucci, the film is available on DVD via PBS Distribution. This intimate portrait of maverick painter and printmaker Elizabeth Murray explores the relationship between her family life and career, and reconsiders her place in contemporary art history. Excerpts from her journals voiced by Meryl Streep, verité footage and home videos show Murray’s internal struggles and incredible ambition. Exclusive interviews with art world luminaries describe the thriving New York art scene within which Murray challenged and captivated her viewers. In 2005, Murray was the fifth woman to be celebrated with a retrospective at the Museum of Modern Art. Breaking convention, Murray’s paintings still defy efforts at categorization. Through them she made an indelible imprint on the contemporary art world. This film chronicles her remarkable journey from an impoverished childhood in Chicago to the extraordinary art world of lower Manhattan, before she lost her life to cancer in 2007. American Masters: Everybody Knows…Elizabeth Murray cements Murray’s legacy as one of the great painters of our time. Directed and produced by Kristi Zea. Experience a century of food through the life of one man, James Beard (1903–1985). Dubbed the “Dean of American Cookery” by The New York Times, Beard was a Portland, Ore., native who loved and celebrated the bounty of the Pacific Northwest. He spoke of the importance of localism and sustainability long before those terms had entered the vernacular. At a time of “all things French,” Beard appreciated what America had to bring to the table, and was the first chef to go on television to teach not only women, but men, how to cook. A cookbook author, journalist, television celebrity and teacher, Beard helped to pioneer and expand the food media industry into the billion-dollar business it is today. Written and Directed by Elizabeth Federici. Produced by Elizabeth Federici and Kathleen Squires, the film is available on DVD via PBS Distribution.